The Washington County Elementary School’s 6th Grade Ambassadors are hosting The Great Kindness Challenge for our kindergarten through 6th grade students. The Great Kindness Challenge is one week devoted to performing as many acts of kindness as possible. 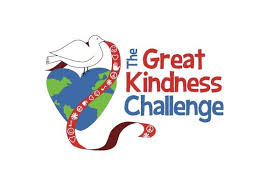 The Great Kindness Challenge will be held at WCES January 28th-February 1st. Each morning will start with a kindness announcement. Students will work on completing various kindness activities throughout the week. For every ten kindness activities completed, students get to write their name on a paper gumball. The gumballs will be added to a giant gumball machine on our entryway bulletin board. Two other events during this week will be a food drive and a kindness buddy event. The food drive (more information below) will be a competition between each grade level to see who can bring the most food. The winning grade will get root beer floats. The kindness buddy event will be held Friday, February 1st in the afternoon. Younger students will be matched with an older student to participate in kindness activities. Food can be sent to school anytime from January 28th through February 1st. Please do not send any glass items. Thank you for supporting our 2nd annual Great Kindness Challenge at WCES!